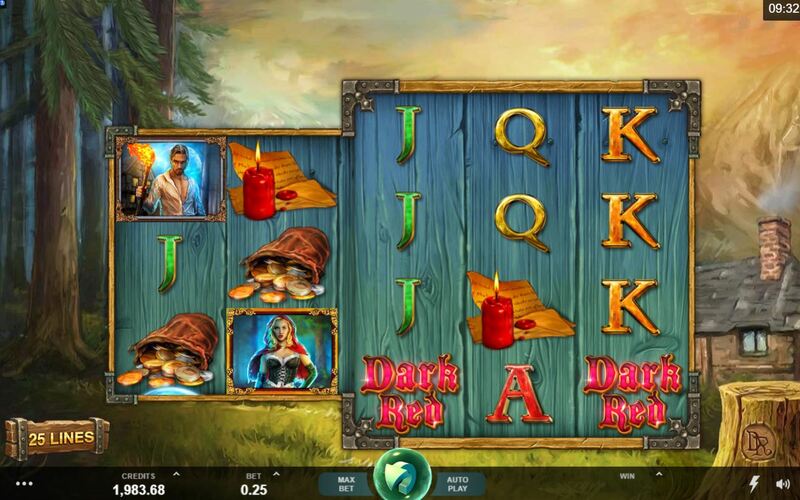 Wicked Tales Dark red slot is actually the creation of one of Microgaming's smaller in-house developers, Triple Edge. 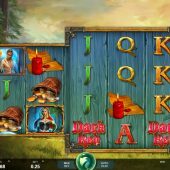 This isn't unusual as Just For The Win and Stormcraft (Fortunium slot) have recently designed slots for the Microgaming platform too. Here the theme is Gothic and dark as the title infers with wooden reels over a background of a lonely house in the forest with a soft classical music score as the reels whir gently, with a loud burst of music if you win. The graphics aren't childish which is a positive, they remind me of Iron Dog's Blood Queen which does the sinister subject matter quite well too - so far, so good. Dark red has overtones of blood in which case let's hope our bankroll isn't cut open in this Wicked Tale! We have 25 paying lines here which isn't unusual, but what is are the reels - 3 reels are 4-rows high and 2 reels are 3-rows high and the block of 3x 4-row reels moves every spin into a random 'Wandering Reels' position. So they can be centre three, first three or last three and there is a reason for this which we'll come to shortly. For now we'll get an idea of the potential by seeing the 5-of-a-kind pays for the stacked symbols here: the Game logo is a Wild which appears singly and pays 20x, as does the Lady and then Male 8x, Wolf 6x and the Locket 5x. For your 25-coin bet you'll get 80 coins for the Money Bag, 70 for the Candle and 60, 50, 40 and 30 for Ace down to Jack respectively. So why the 4-row reels? Wherever the 3 big reels are, they will always have the possibility of landing a 'Jumbo' 4x3 block symbol, so if this occurs on the first three reels you are guaranteed 25x 3-of-a-kind wins. Naturally you'll need a match on reel 1 or both the first 2 reels if the Jumbo Block moves to the right at all. Now we come to the fun part and I would like to believe Triple Edge Studios have read previous reviews of mine where I constantly bemoan slots that trigger the bonus only to offer you a wheel with rubbish cash awards and no guarantee of a feature such as free games!! Yes, we get a 'Feature Guaranteed' Wheel - yippee! Okay, before I get too excited by this Godsend let me tell you that we do get cash prizes first from 2 - 20x each time you land on one, but after a couple of these you'll land on either the Treasure Chest to trigger the 'Forest Of Fortunes' pick-me or one of the 4 highest reel icons from the slot which will trigger free spins. You get 10 picks from a grid of chests with 1 or 2x bet cash values. This may sound low but each time you get cash and miss the Wolf hiding in one of the chests, your multiplier rises by 1x to a maximum of 10 for the last pick so a reasonable amount can be accumulated. You get 9 free spins but cannot retrigger them. Now you get an enhancement though - when you triggered these spins on the Wolf's Wheel the high-paying symbol you landed on will replace the other three higher-paying ones too on the reels to increase the chances of bigger prizes. You maximum pay on any one spin is 500x bet if you are on the Lady character and you hit a full screen of her.